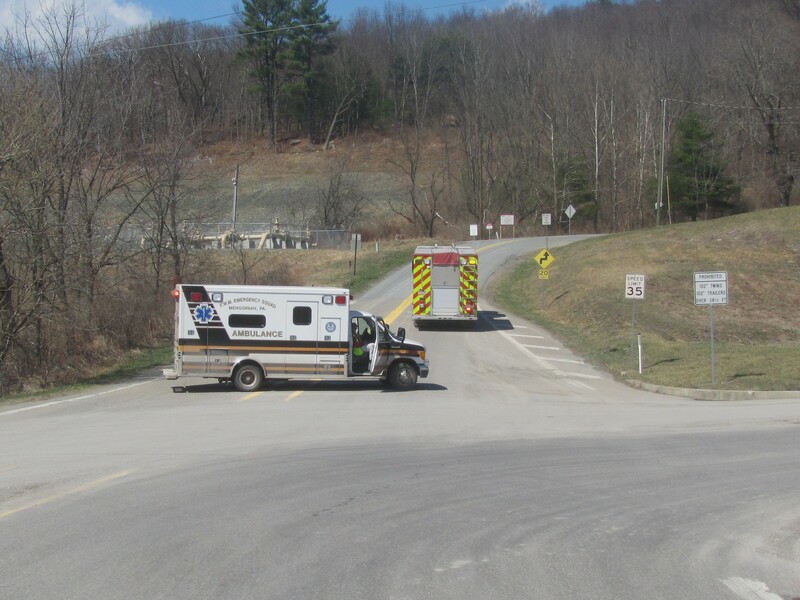 Volunteers from the Meshoppen Fire Company and the FWM Emergency Squad (above) blocked the southern end of Meshopany Ridge Road on Saturday after an unscheduled release of highly pressurized natural gas occurred at the Manning Compressor Station in Washington Township, Wyoming County. The sudden release of natural gas at the Manning Compressor Station in Washington Township, Wyoming County, on April 12 was a serious situation. But it did not escalate because of the safety systems that have were employed at the plant in the course of its construction. “It was a scary release,” Wyoming County EMA Director Gene Dziak said in reference to the unscheduled venting of an unspecified amount of gas at the UGI-owned facility on Meshopany Ridge Road. The release is a built-in safeguard that occurs when pressure unexpectedly mounts in the pipeline or the facility. The anomaly prompted an LEL (lower explosive limit) alarm to UGI control, and the unit shut down approximately 35 minutes after the initial release. “It was brought under control very quickly,” Dziak stated. Dziak was especially impressed by the effectiveness of local emergency responders, in this case the Meshoppen Fire and Police Departments and Mehoopany Ambulance. Colleen Connolly, DEP’s regional Community Relations Coordinator, noted, “One of our Emergency Response Team members went out on Saturday to investigate with Wyoming County EMA, and it appears that all systems worked properly during the incident.” DEP willl further confer with UGI, she added. The event also caught the attention of C.O.G.E.N.T. (Connection for Oil Gas & Environment in the Northern Tier). Co-founder Emily Krafjack offered the following preface before sharing a link to the only story published about the incident. She suggested that residents of Washington Township are better protected in such cases because the municipality has zoning in place. Unlike many other gathering line operators, UGI adds an odor to the gas at the Manning Compressor Station, which is why area residents and first responders could smell it. This safety feature is not required by law. Ideally, nobody wants to see parts malfunction, but it’s understandable that residents are alarmed by the sound of venting gas, he noted.